Designed to save the Contractor installation time and labor, EPCO's Air Conditioner Whips are typically used to connect the Central Air Conditioner Compressors to the AC disconnect box. A number of Liquid Tight Connectors are available for any application including 45º, Straight, and 90º Connectors. 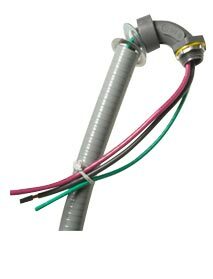 Three (3) Conductors are included with either 1/2" or 3/4" Non-Metallic Liquid Tight Conduit using either 8 or 10 AWG THHN Conductors. Air Conditioner Whips include one (1) Straight and one (1) 90º Connector. Three (3) Conductors are included in 1/2" or 3/4" Non-Metallic Liquid Tight Conduit using either 8 or 10 AWG THHN Conductors. EPCO will also build "Custom" Air Conditioner Whips to your specifications in any length using UL Listed components. Contact EPCO Inside Sales (800.336.1976 or sales@engproducts.com) for more specific information. Meets the requirements of the 2017 National Electrical Code: Articles 310.10(C)(H)(2) and (4), Table 310.15(B)(2)(A), 356.10(1), (2) and (3), 350.22(A), 350.30(A), 356.10, 356.20, 440.6 and 440.31. Labor and Time Savings! Cost effective Non-Metallic AC Whips save the Contractor time and money. Convenient packaging of ten (10) or twenty (20) AC Whips per Carton.